Cnidaria as a whole are a basal lineage right at the root of the bilaterians, clustered right next to comb jellies and certain types of sponges; you go any further basal and you hit the remaining soft sponges and the base of all animals (and from there you're reaching common ancestry that is single-cellular and is common to animals and the other opisthokonts such as fungi). They consist of two cell layers, with jelly in between, forming the mesoglea. Depending on the life stage, some are able to open and close their single cavity leading into their internal feeding and respiratory pocket, which allows them to form hydrostatic skeletons. In most groups you have alternating forms between sessile polyps (like that we see with corals and sea anemones) and motile medusae (the jellyfish form we're most familiar with). I'll just take a moment here to point out that until now I didn't realize they were insistently called "sea anemones" because there is a whole group of flowers (anemones) that their name is a reference to. In the classical Linnean taxonomy, life was set into heirarchies, starting with kingdoms, working down through phyla, classes, orders, families, genera, and species, with all sorts of supra- and subdivisions throughout. In more modern parlances we tend to add another layer above kingdoms, the domain, and frankly there are a number of important taxa and clades that have labels that fall outside of this set of frankly arbitrary divisions. The general rules of organization, however, hold true, and when we discuss a phylum, we have a mental scape of dealing with a rather large collection of organisms that share a common origin. Among what we classically think of as kingdom Animalia, phylum Cnidaria consists of a number of somewhat familiar groups. The major groups are the Anthozoa, which includes the sea anenomes and corals, the Hydrozoas, which include the hydras (essentially tiny anenomes) and the conglomerate organisms like the Portuguese Man O'War. 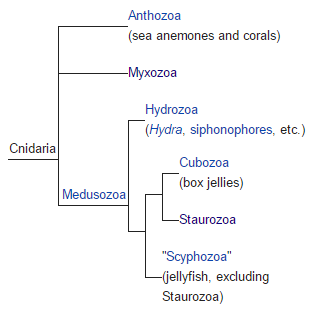 The Cubozoa contains the box jellies, and then between the Staurozoa and Scyphozoa you have the remaining classic jellyfish (although outside of Cnidaria you have some other morphologically similar creatures, namely the comb jellies, but that's a talk for another time). But of course, as you look at the phylogeny to the right, it would seem I have left out a group, the Myxozoa. The Myxozoa have had an odd history in systematics. They were considered for.. far too long, to be protozoa, a pretty broad label for a grab-bag of nonanimal single-cell eukaryotes, a group called Sporozoa. But that's not super relevant, considering I've already stated that they're Cnidaria. The main reason this relationship was unclear for so long was because Myxozoa are REALLY simple. Every one of them is a parasite of cells or tissue, and can be found in an abundance of marine and freshwater bryozoans, annelids, and fish. They're typically microscopic, rarely more than a dozen cells or so, incredibly reduced. They've lost loads of genes normally involved for the maintenance of multicellularity, they lack distinct organs and tissues, they have simple two-step reproductive cycles, with differing hosts. Honestly they really are so simplified that they have very little in common with other Cnidaria. It's all quite interesting. They had been studied for nearly a century, flung about the protozoan clades, before modern genetic and molecular techniques allowed for clarification of their relationships. The major clues are a common organelle type (polar bodies, which are homologous with nematocysts) and the DNA evidence. And that's it. They're so simple there's essentially nothing else in common. Polar bodies function similarly to nematocysts, a springloaded firing mechanism, but instead of being a toxin delivery system, they're simply an attachment mechanism. So. What happened? How did some sort of stinging Cnidarian become this.. shadow of a basal metazoan? Well, it's hard to tell, in part because of the great variety of host organisms, and simplicity of their body plans, that it leaves a lot of limitations on what we can infer about their evolutionary history (for now). It is a question of when the various missing cnidarian components went missing, and why. And it's a question that for the time being, must go on unanswered. What I love about evolution, the process, is that it has happened, has been happening, for billions of years. What evolutionary scientists do, is try and understand the nuances of how things have arisen, and why. But what I really love, is that even if we do not understand how something has happened, why something has happened, the evidence, whether it be living, fossil, or molecular, is there. It has happened. We don't have to understand it right now to know it happened. So here we have a story where we don't have enough pieces, not yet, to see the whole story. But the story exists, whether we can tell it or not, and that's what I love about evolution. It's a story that doesn't need anyone to hear it.